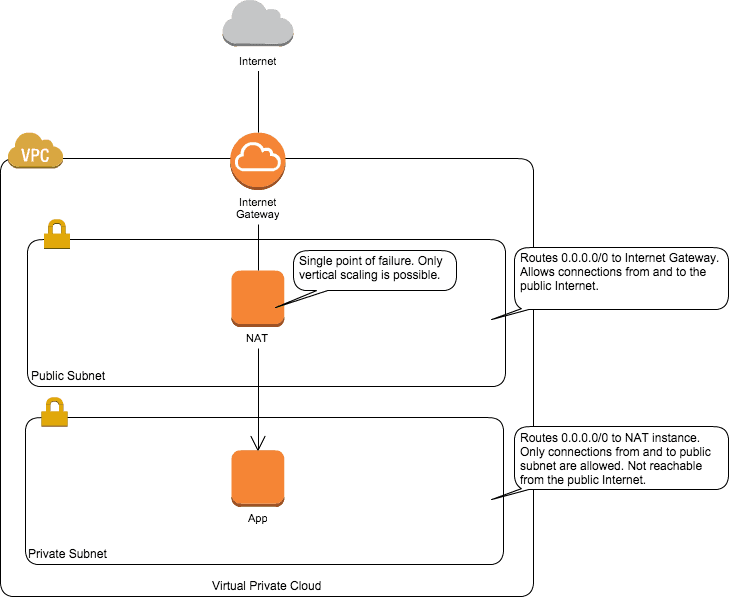 VPC architectures containing a private subnet that includes EC2 instances and needs to connect to the public internet causes issues, especially if you have to do many requests or transfer a lot of data. Note: This blog post was written in July 2015 and is outdated. Amazon released Amazon VPC NAT Gateway in December 2015. Being able to build a private network in the cloud with Virtual Private Cloud (VPC) is a key feature of AWS. But private subnets are broken on AWS. The EC2 instance needs to call the AWS API (DynamoDB, Route 53, and so on). The EC2 instance needs to download packages from a public repository (yum, apt, and so on) to be provisioned or to install updates. Traffic to 0.0.0.0/0 from the private subnet is routed to a single EC2 instance: the NAT instance. You can configure this with the help of the route table attached to the private subnet. The NAT instance becomes a single point of failure. The NAT instance can only be scaled vertically. There are best practices for building a HA setup for your NAT instance (see, for example, the article High Availability for Amazon VPC NAT Instances: An Example at http://aws.amazon.com/articles/2781451301784570), and the limit for scaling vertically is sufficient for most use cases. But is using a private subnet to prevent access from the internet to your app server worth all the trouble? If you need to, you can create an additional public subnet that allows connections from the public internet (for example, to run a SSH bastion host). tl;dr: Think twice if you’re planning to use a VPC architecture containing a private subnet that includes EC2 instances that need to connect to the public internet, especially if you have to do many requests or transfer a lot of data. Good news if you only need to connect to S3 from the private subnet: as of May 2015, you can use a VPC endpoint for S3 (see http://aws.amazon.com/de/about-aws/whats-new/2015/05/introducing-amazon-vpc-endpoints-for-amazon-s3). A NAT instance is no longer required for this use case. What do you think? Let me know: andreas@widdix.de or @andreaswittig. Are you interested in learning more about AWS? Michael and I are writing a book called Amazon Web Services in Action that will guide you into the AWS universe.